Do you love your swiffer but hate the cost of the disposable swiffer cloths? It’s a common frustration but there are a few homemade solutions that can come to the rescue. Here are five ways you can make your own homemade swiffer covers, all of which are pretty simple to do. In fact one of the ideas only requires you to find a fuzzy sock! 1. 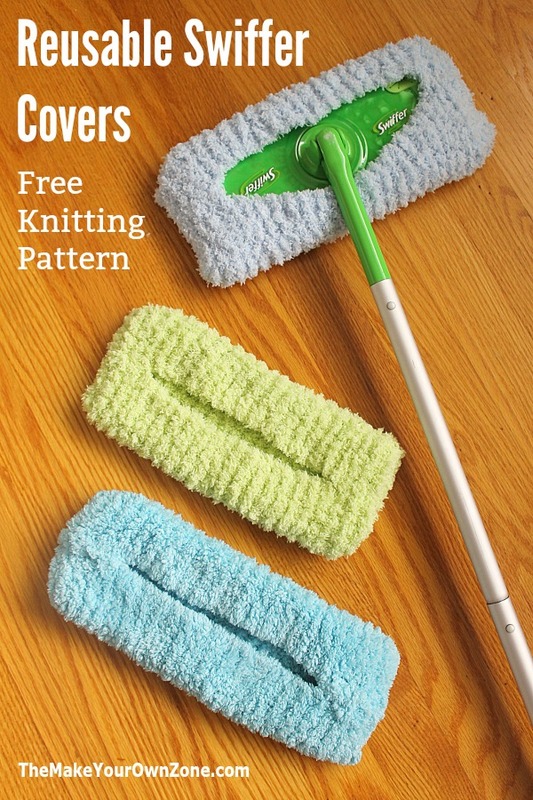 Knit a Swiffer Cover. If you have a few basic knitting skills you can knit up one of these quick and easy reusable swiffer covers. I find that the soft fuzzy yarns are great at picking up dust, hair, and other fuzzies from the floor and they wash up nicely too. If you can knit a rectangle in basic garter stitch and sew a few small seams, then you can make these covers. They’re a definite favorite at my house! 2. Crochet a Swiffer Cover. 3. 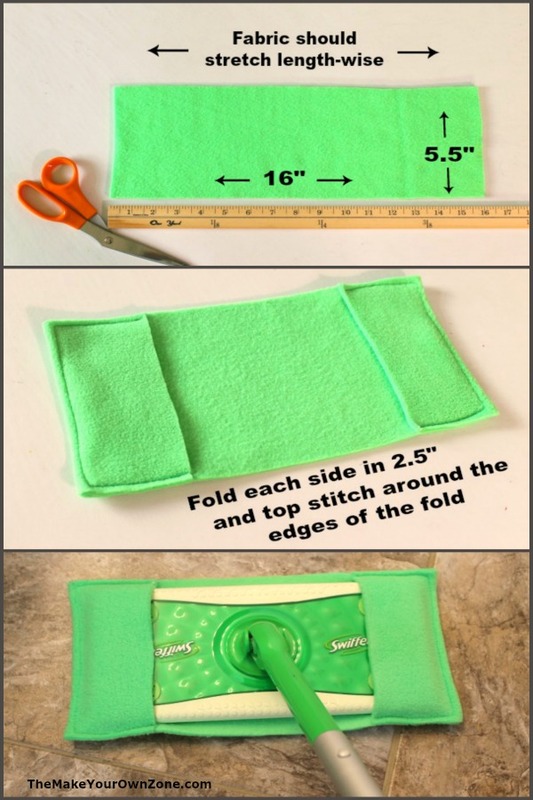 Sew A Fleece Swiffer Cover. 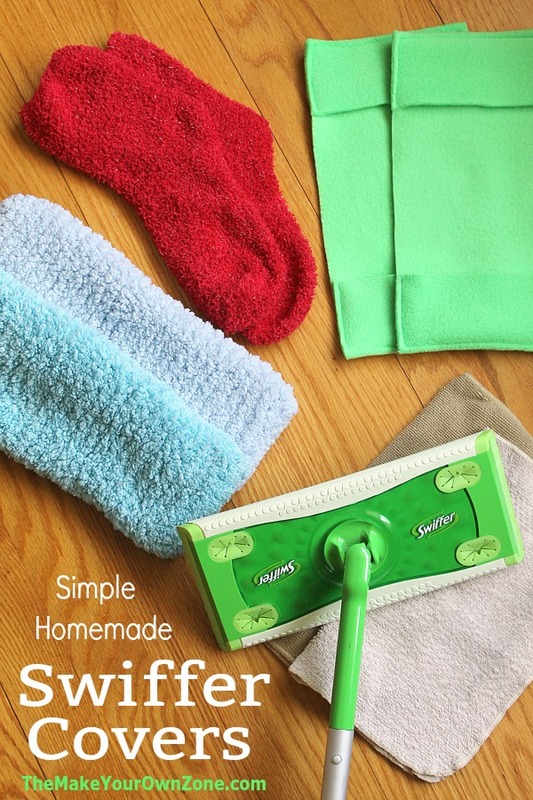 Another simple solution for making a homemade swiffer cover is to sew one from a piece of fleece fabric. Fleece is a great option because it doesn’t ravel like other fabrics and is soft for using on your floors too. My method is to cut a piece of fleece fabric that’s 16″ x 5½” (The stretch of the fabric should be going the long way of your piece). Then I just fold up each end 2½” and topstitch around the edges of the fold with a 1/4″ seam. This creates a couple of little pockets to slip your swiffer into. Because the fleece has some stretch to it, it you can pull it over your swiffer and you’re good to go! 4. Use a Microfiber Cloth or other Cleaning Cloth. The other methods mentioned so far are strategies that work the best for dry swiffering. However when I want to use my swiffer with more of a wet-style swiffer cloth, I use a homemade strategy of just putting my own microfiber cloth or other cleaning cloth onto my swiffer. You can just wrap the cleaning cloth around the swiffer and tuck the edges into the “grabbers”. I always use an old washcloth on my swiffer when I’m cleaning my hardwood floors with my DIY No Vinegar Hardwood Floor Cleaner. I often spray my cleaner directly onto the washcloth on my swiffer, and then mop around the floor (and then keep repeating as needed). When I’m done, I just take the cloth off and toss it in the washing machine. Super simple! 5. Throw a Sock On It! And finally, for all you “craft challenged” folks who don’t knit, crochet, sew, or don’t even have an old cloth hanging around the house, here’s your inspiration. 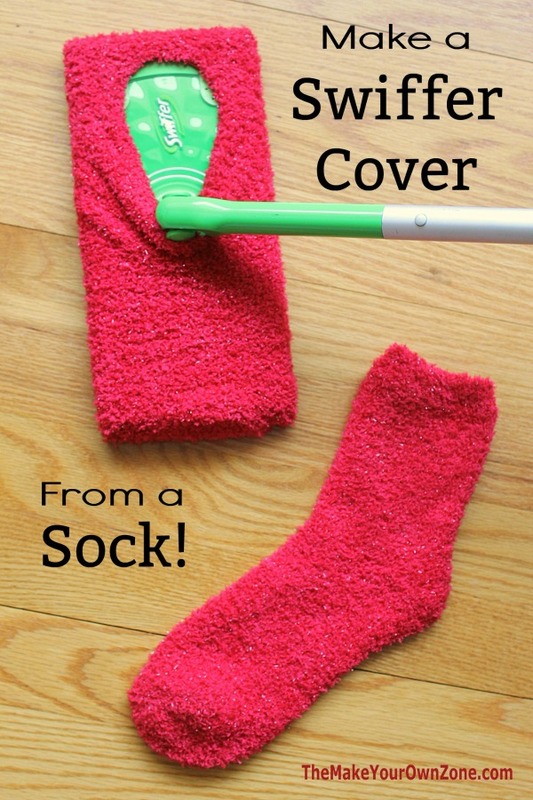 Find a soft fuzzy pair of socks and you too can make your own swiffer cover. I can almost always find this type of sock at my local dollar store and they make great homemade swiffer covers. Just like my homemade knit version, the soft fuzziness of the socks are good at picking up dust and hairs. Just stretch one of the socks around the swiffer and you’re good to go. And because socks come in pairs, you’ve always got another spare one around if your other “sock swiffer cover” is in the wash.
Any of the ideas on this list are an easy way to get started with a reusable swiffer cover method for your household. In addition to saving money, it’s also a way to create less waste. All of these covers can be used over and over many times and wash up well. Once you start using reusable swiffer covers, I’m sure you’ll like them!